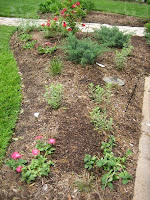 Last week I got my last 30 annuals planted - wave petunias. Knowing we had graduation events coming up, I purchased the large plants to the tune of $3 each. They filled out the back planting beds nicely. I was excited when they began to bloom by Katie's party last Saturday. Monday as I walked around the yard, I noticed that eight of the plants had been eaten by the ever expanding bunny population in our yard. By Tuesday morning another dozen had fallen prey to the salad bar bandits. Frantically I dashed around spraying each plant with a hot pepper mixture I had gotten at the local garden shop last year. Imagine my surprise when I went out this morning to find that the remaining plants had been decimated. What, did I spray them with Bunny Foo Foo or something? Incensed, I went back to my garden shop this morning to inquire as to whether or not they now sell guns. A bit perplexed, the clerk shoot her head in the negative. "Well, I guess I need a bottle of 'Liquid Fence' then", I retorted. Ahhhh...now she gets the gun question. I think she had to call the police station back and cancel the request for assistance in handling a deranged gardener. My not so waving petunias are now bathing in 'Liquid Fence", which smells a lot like manure. The dog, of course, loves the aroma, so let alone protecting the petunias from the rabbits, I have to guard them from the dog. If I go out tomorrow morning and find further damage to the plants, I'll be scooping up little bunny fofos and bopping them on the head. Where is Elmer Fudd when you need him? This was Katie's last week of high school. Ever. Her final exam was on Thursday, so she officially checked out and received her graduation gown. While she is done, I am still mired ankle deep with the photos for the memorabilia boards for the seniors all night graduation party. I had a "Picture Party" on Monday night, which means I bribed four other moms with wine and margaritas to come and help my co-chair and me post 500 pictures and newspaper clippings on 8 large sheets of foam core board. As the boards are really expensive to purchase ($222 for them, which I had to buy because last year's clean up crew threw them away! ), I found removable glue dots to affix the photos to the boards. The kids are allowed to remove any photos they want around 3 in the morning, so the trick is to make them easy enough to remove without damaging the boards or photos. The year before last the mom carefully stapled across the corners of the photos. The photos came off easy for the kids, but then she sat and removed each staple afterwards. That sounded like waaay too much work to me. So, drinks in one hand, glue dots in the other we proceeded to relive the lives of the students one photograph at a time. 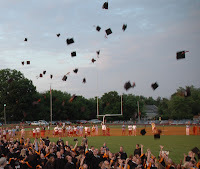 Childhood memories, sporting events, clubs and activities right up through the recent prom filled the boards. A couple of hours and our task was compete. Or so it seemed. The next morning I came down to find my dining room floor papered with pictures. Thinking that perhaps some dots were applied incorrectly (maybe due to the libations? ), I added additional glue dots and then ran a soft cloth over all the photos to more firmly adhere the dots. Each morning this week, I peered into the dining room to the same, littered scene. By now I feel as though I am in "Groundhog Day". I always have hated that movie. Because we were having Katie's graduation party for her friends on Saturday, I gathered up all the fallen faces and gingerly dragged all the boards into the laundry room for the day. I will have to deal with them later today. I'm at the point where if I don't see another picture again it will be too soon. However, the party yesterday turned out great. The reason that we held it so early, since graduation is technically taking place this upcoming Friday, is because of A-men, the acapella singing group at the high school. A couple of months ago my friend invited Jim and me to the Class of 2010 auction. Up for auction was a private concert by A-men. We thought that would be a fun addition to Katie's party or, just in case SHE didn't think it would be a fun addition, we could have them sing at the garden party SWT will have in the fall to celebrate the completion of their new building. Anyway, Katie loved the thought of having them at her party, and since several members of the group are seniors as well, this weekend worked to get them all before their own family commitments kick in. So one party is down, the graduation and family party are next weekend. And in between are the blasted boards. I can't wait until it's over. A-men! 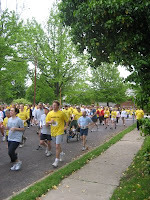 Today was the eighth annual Jim Schoemehl 5k run/walk for ALS in Webster Groves. A run of this length is a fairly common occurrence, but what makes this one so special is that it is put together entirely by the senior marketing students at the high school. The students set up a website for information and registration, gathered sponsors, came up with the route, and took care of all the advertising and marketing, including design and printing of the t-shirts. Arriving at the school at 6:00 a.m. this morning, they readied the registration tables, marked the route and set up water stations at each mile marker. What an unbelievable way for the kids to take classroom learning and put it to a practical and beneficial use. Half of the money raised goes to a local organization which provides assistance to those fighting ALS, and the other half goes to a local resident who has been diagnosed with ALS. This year's recipient is Barry Kurre, a Kirkwood Vietnam Veteran. Once the students met Barry, this run went way beyond being an assignment for a grade. As they saw the debilitating toll ALS has taken on Barry's life, they began to see the race as a challenge to make more money than any other year so that they could help make the lives of ALS patients a little easier. Barry was brought to the high school parking lot by ambulance. At first I thought a runner had been injured, as I didn't know he was coming or even what his condition was at this point. The runners and walkers and student volunteers all gathered around for the presentation of the check to his family. If you needed a visual to understand what this disease does to a person, it was abundantly clear today. I didn't hear a final total on monies raised, but I watched as they presented Barry and his family with a check for over $18,000. And I thanked God for a school that has found a creative and fun way to think outside the box and take learning to the streets. This morning while waiting for my tea to brew, I opened up a fortune cookie from our favorite local Chinese restaurant. I don't really like fortune cookies all that much, but it is always fun to see what words of wisdom will spew forth from the tiny sliver of white paper. This particular cookie was unfortunate. Literally. There was nothing written on either side of the paper. No soothing words that I "deserve special treatment", or the momentary quick thrill that "a windfall is coming my way". Or even the one that surely was written by a sarcastic mother of a teen advising that "the fun side of a relationship begins to unfold". 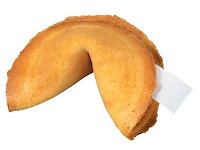 So how much misfortune will befall the person who receives an un-fortune cookie? This is what I would type on my sliver of paper: "Woman who receives blank paper in fortune cookie will have much on her mind!" How many muscles do we have? I feel each and every one of mine. I went to the nursery Sunday and purchased my annuals. Good thing I went by myself because even the front seat of my car was holding plants by the time it was all said and done. And I have a Buick Rendezvous! In my defense, I did purchase two large bags of a specialty potting mix for my container plants, so those took up quite a bit of space. One thing you don't think about as you get caught up in the color and flavor of the nursery, with all of the outstanding container arrangements inviting you to try your hand at creating a unique garden spot in your own yard, is the fact that for each of those bright, fresh faced annuals a hole must be dug. By you. After five hours in the yard Sunday afternoon, which did include a mowing of the grass as well, I could barely stand upright. Too bad my clever little kneeling pad doesn't do a thing for my back. I was feeling pretty good about my success until I looked at the tables on our deck and patio. There were still 4 or 5 flats of annuals straining to be released from their plastic constraints. And that did not include the tomato, cucumber and dill plants that require special treatment since I am attempting to grow them in containers this year. Or the 5 evergreens, 5 cotoneaster shrubs and 4 hostas my husband had picked up last weekend. I got a couple more hours in yesterday, muscles screaming in pain as I stooped and bent, and will try to finish the job today. All of this is in preparation of the graduation parties. We will be having one for Katie's friends in two weeks and a second Memorial Day weekend for our family. Good Lord willing, both of these celebrations will take place in the back yard. Now, where is the phone number for the Pink Sisters? I can't even get a decent photograph of our profusely blooming buckeye tree. It won the 2008 tree of distinction award in Webster Groves last year, and we received a nice frame with the award on one side and a place for a photo on the other. Last year was crappy when it bloomed as well, so the city did not take a photo of it for the frame. I was hoping to be able to rectify that this season. Maybe the cooler temperatures will keep it in bloom longer. I had planned to get the rest of my annuals in this week. I could have planted in the rain, since I already looked like an idiot earlier in the week as I mowed in the rain. But I have this aversion to getting totally caked in mud. Now I hear that it may get into the 40's tonight, so I guess it is best that I waited. But the first graduation party is in two weeks, so the pressure will be on to get the yard in shape. The parties will be held outside, if it ever decides to stop raining here. If it doesn't, we'll be putting those sun umbrellas to a whole new use!